Fresh strawberries are a common offering in the souks. What a week. Tom was sick for days. I was miserable with the remnants of way too any sand fly bites itching relentlessly for days. The scorching heat with no AC was remedied in part by Madame Zahra hauling a standing floor fan into the salon which helps. (Oddly, today, it's cooler). Samir shopped for us outside the Medina, finding a spray bottle of insect repellent that US $25 later proved to be well spent. It seems to work although I have a few new bites, each itching like crazy for a week or more. Sadly, our friend Lane passed away which we shared in a tribute to him that we posted two days ago. It was a tough week. This oranges were huge as shown by the comparison to the water bottle in the upper right. The smell permeated the air as we walked by. As for the better parts; We booked three more tickets for our kids for Hawaii with only one more to go as we wait for Richard's preferred dates. Soon, we hope. Prices continue to climb. It's fallacy that prices are better on Tuesdays. We've been watching prices daily for the past two months and Tuesdays are no different at any time of day than any other day of the week. Actually, we managed to go out to dinner on Sunday evening, having an experience that we're surprised hadn't occurred here in Morocco up until now. I was served food laden with wheat but was told it was gluten free. 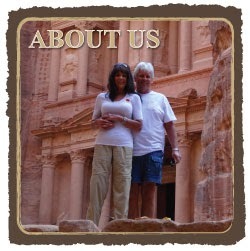 We've been dining at a favorite restaurant in the souk once a week over the past few months. Over the past month I've been ordering a dish I was assured was gluten free, grain free, starch and sugar free. Many shops in the souks offer cheaply priced leather and cloth bags. Kefta Tagine is a dish made with small meatballs (without bread crumbs) placed into a non sweetened tomato sauce similar to an Italian red sauce supposedly made without sugar and seasoned with Moroccan spices. On the side, I'd always order a plate of sautéed vegetables with julienne carrots, zucchini and peppers never thinking there was any risk in ordering the sautéed vegetables. As we sat in the cozy restaurant at a corner table, our regular waiter served the usual complimentary nuts for me, bread sticks and olives for Tom. These "appetizer" items added to the appeal of this restaurant as Tom and I repeatedly ordered the same dishes over and over, with few other appealing options on the menu. (Repetition is not a factor for us which we've learned may be necessary when dining out frequently with few choices available that are suitable for me and acceptable to Tom's picky taste buds). This appeared to be a display of decorator items, perhaps, locally made. The Kefta Tagine tasted especially good to me as opposed to other dishes I'd ordered in various restaurants. After multiple reassurances from both the chef and the waiter, I accepted their comments as fact that this dish was free of any of my restricted items. Speaking good English they both seemed to understand. But, the extra good flavor nagged at me. One might ask, if I eat gluten, starch or sugar, would I immediately notice a difference? Not immediately. Carb laden foods including sugar, grains and starches causing inflammation in the body. If I eat enough of these forbidden foods, it could take days for the effects to become apparent. I don't have Celiac disease but am obviously sensitive to gluten. A person with Celiac could have an immediate reaction, impacting their health for days or weeks as their symptoms exacerbate. I found what at first I thought was a worm in my plate when I'd been assured my dish was 100% gluten and starch free. No wonder I liked this dish so much when in fact on Sunday after finding these noodles, I surmised that they had a huge pot of the red sauce in the kitchen filled with noodles. When I placed an order for gluten free, starch free Kefta, most likely they scooped out the sauce and meatballs picking out any stray noodles. I should have paid more attention to my instincts. The taste was "starchy." When I called the waiter to our table, he was flustered and embarrassed, stumbling over his words, going on to explain that my side order of sautéed vegetable, was precooked in the same water used to cook pasta. Double whammy! My main dish and veggies were laden with gluten. Not one to complain loudly (neither of us tend to make a fuss) I asked the waiter why the chef thought this was acceptable. He answered that the chef thought was would be OK. Assume nothing. Asked and answer. Answer is wrong. Lesson learned, once again. Don't order anything from a pot of any type or any mixed dish with many ingredients. I should have known better. The vegetable? Who'd think that sautéed vegetables would be precooked in a pot containing pasta cooking water? Another walk through the souk late in the day as we made our way to the restaurant on Sunday. Most weekend tourists have left by this time making it easier to walk through the souks. This situation serves as a lesson for me and hopefully for any of our readers out there who possess a gluten allergy, sensitivity to gluten or Celiac disease. Also, this impacts those of us who also strive to maintain a low carbohydrate anti-inflammation way of eating. Luckily none-the-worse-for-the-wear, we've decided to forgo dining at this restaurant, although the waiter did "comp" our bottle of water for the mistake. Oh. Generous. Now our dining options are narrowed down to one restaurant, Le Jardin. Preferring, at this point, no longer wanting to spend US $25 on taxis or take the long walk to the petite taxi stand in the scorching heat, we've narrowed our options down to one restaurant since Tom will not eat a single tagine or Moroccan spiced food. A cat outside our door when we returned to the house after dinner. Le Jardin is the only restaurant in the souks that has offers a few non Moroccan dishes that is open all day. Other restaurant don't open until 8:00 pm, too late for us to dine when we only eat one meal a day. With nine days remaining until departure, I imagine we'll dine at Le Jardin three or four more times until we depart, dining in with Madame Zahra's cooking on the remaining date. Besides, they have the two turtles on "crumb patrol" at Le Jardin and, the two parakeets, greatly adding to the experience. With no photos taken that day (soon these photo free days will get to the end of the point whereby we began posting photos every day, as we do now). 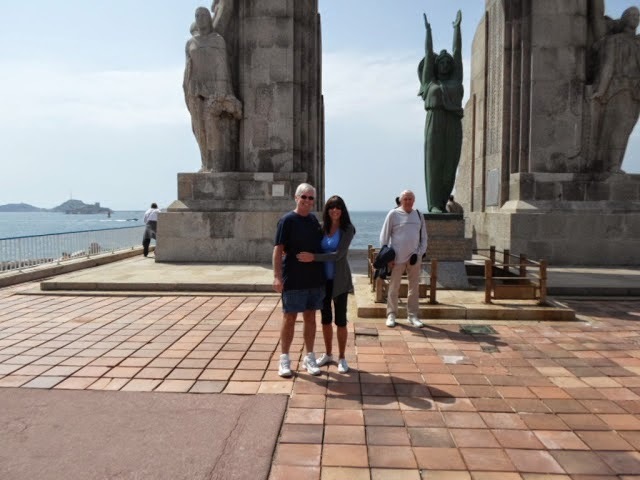 Instead, we've included this photo of Tom and I while sightseeing in Marseilles on May 4, 2013. For the link for May 6, 2013 when we stayed overnight in a hotel in Barcelona, please click here. Tom and I on a cool day outside this archway in Marseilles, France. Gee...I wish I still had that sweater!